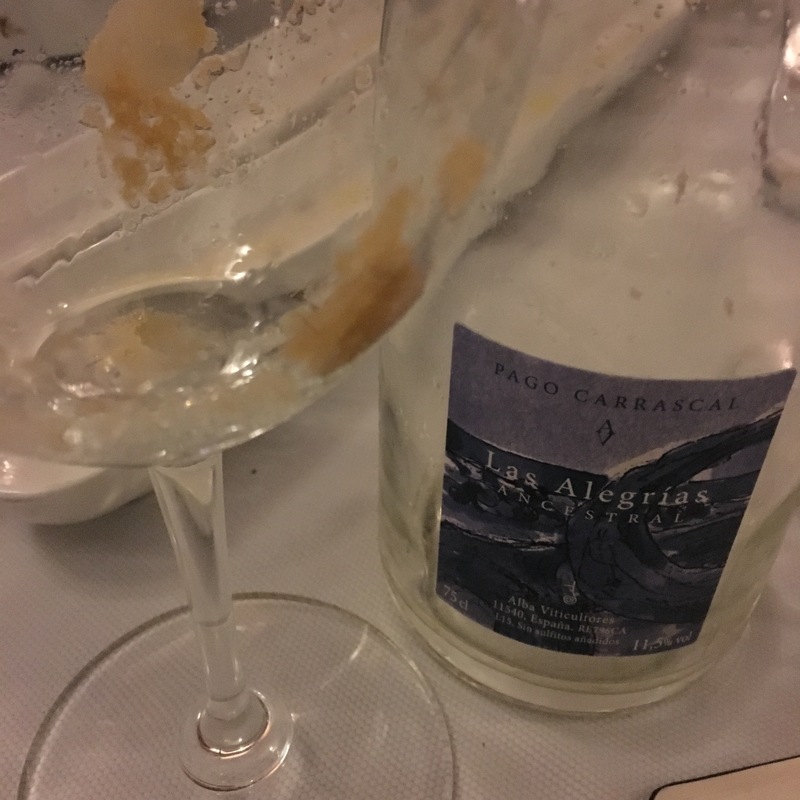 This wine got “left behind” at our recent tasting of the wines of Alba Viticultores in La Buena Vida and lived to see another day – or specifically a night in Sacha. It didn’t see much of it though – it was gone so quick I didn’t even get a picture of the liquid itself (and although it now strikes me as unappetising, the above picture shows just how natural these wines are – boy was that last gulp a tasty one!). It is an ancestral method wine from the Las Alegrías vineyard (Pago Carrascal de Sanlucar) fermented in a 1,000 litre tank for two weeks before bottling with some residual yeasts and sugars. They disgorge these by hand to order – so this one has around 8 months on the rack before disgorging. This was a more serious proposition than the other ancestral that we tried the first time around, with less residual sweetness and more marked aromatics and flavours. Really noticeable carbonic and a metallic nose to it at first, but then creamy, herbal and grassy aromas came through, and although it didn’t have big acidity it had a nice saline bite and a bitter herb finish giving it a nice structured trip across the tastebuds. Another fascinating wine alright.